London (AP) — Turns out, Isaac Makwala is healthy. Really healthy, in fact. So healthy, that after getting called back to the stadium for a surprise command performance at the world championships Wednesday, he ran two 200-meter sprints — the first all alone on the track — qualified for the final and even dropped to the ground and pumped out five pushups near the finish line. The Botswanan sprinter’s plight became the cause celebre of the championships when he threw up before the start of the 200-meter preliminaries Monday, was determined to be among the handful of athletes afflicted with the stomach flu and was barred from the stadium for 48 hours to lower the risk of infecting other runners. All along, Makwala insisted he was not sick. One of his managers, Sander Ogink, told The Associated Press it was simply a case of nerves. “As you probably know, athletes throw up when they’re nervous,” Ogink said. But the IAAF held firm, and Makwala was scratched from both his 200-meter heat and the 400-meter final, where he could’ve been the main challenger Tuesday to the eventual gold medalist, Wayde van Niekerk. 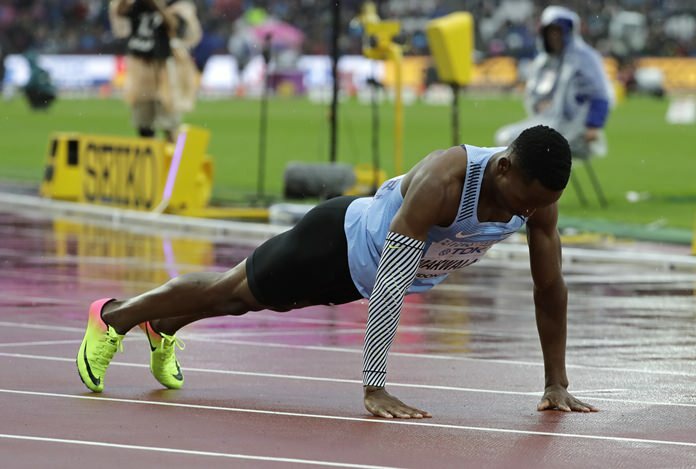 After further review, and another visit from the doctor, the IAAF determined that while it couldn’t do anything about the 400 — Makwala showed up to the stadium for it Tuesday but was turned away — it could try to right one wrong. He was asked back for Wednesday’s action. He opened the proceedings on a dreary, rain-drenched night by lining up in Lane 7 with nobody else on the track. His goal was to beat the slowest non-automatic qualifying time from the day before — 20.53 seconds — and after he crossed in 20.20, he dropped and gave ’em five, snapped off a salute to the crowd, then hustled off to get ready for the semifinals. Back out in the rain two hours later for that race, Makwala finished second to earn his berth in Thursday’s final. His best race is the 400. His only chance now, though, will come in the 200. For the past several months, America’s top name in the women’s game, Allyson Felix, could say the same. She dropped all the other distances with an eye on the 400 and a chance to right a wrong from last year’s Olympics. There, she was neck-and-neck with Shaunae Miller at the finish, when Miller dove over the finish line and grabbed the gold out of Felix’s grasp. This year, the finish was strange in a different way. Miller (now Miller-Uibo after she got married in February) was far in front as she made the final turn, but she pulled up lame with 30 meters left, and was practically dragging her left foot to the finish line. Felix was in second but struggling, and through the gap in Lane 6 burst another American, Phyllis Francis, whose personal best time of 49.92 seconds was good for gold. Felix ended up with bronze to move into a tie with Usain Bolt and Merlene Ottey with 14 overall world medals. Miller-Uibo limped home to fourth. Karsten Warholm was also taken aback. The Norwegian hurdler crossed the line first, ahead of two-time champion Kerron Clement, in the 400-meter hurdle finals. Warholm’s eyes went agape and he stuck his fingers in his mouth in a look of pure amazement when realized he had won. Later, he paraded around the track wearing a horned Viking helmet — appropriate given the cold, slick conditions in the stadium where the Olympics were held five years ago. “For me, this is just a good Norwegian summer, actually,” Warholm said. The evening’s other gold went to Gong Lijiao of China in the women’s shot put. But gold medals were hardly the only cause for celebration on an evening full of surprises in track and field. Makwala took his second chance and ran with it. Previous articleNissan Murano blows up a house!